Love it back: A handmade gift for a royal baby? A handmade gift for a royal baby? I think I cooed like a wood pigeon when I first picked up these handmade baby and toddler shoes. The quality is superb, they are unbelievably soft and there's an underlying feel of permanency to them. These shoes would last for generations. Neatly packed away in their luxury handmade cushioned boxes, they are the stuff of family heirlooms. Vevian is the place to go, I reckon, if you want a present for the next royal baby. Listening Pippa? 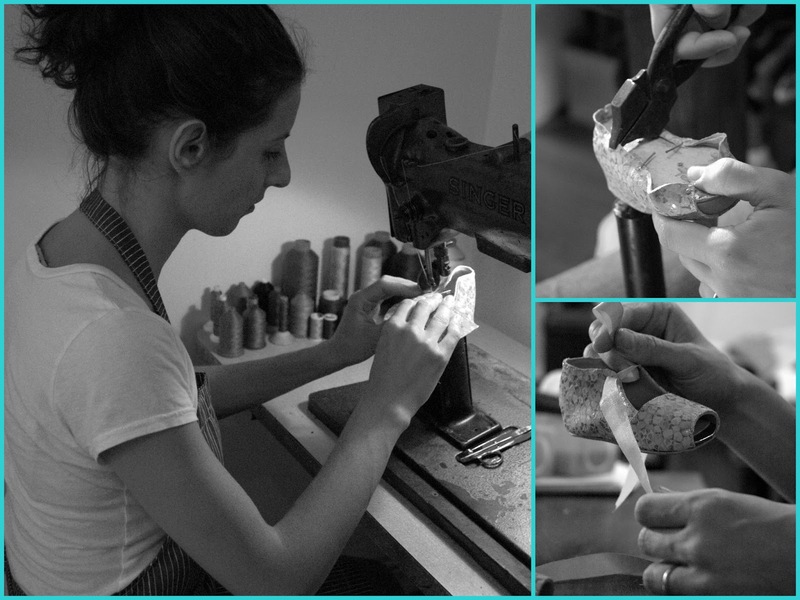 They are designed and handmade by Vivienne Lopez (see below, at her work bench). When I discovered from Barbara Pani, who runs anecdotes design in Folkestone's cultural quarter (yes, it does have one) that the shoes are partly made using discarded materials, I was hot in persuit of the story. 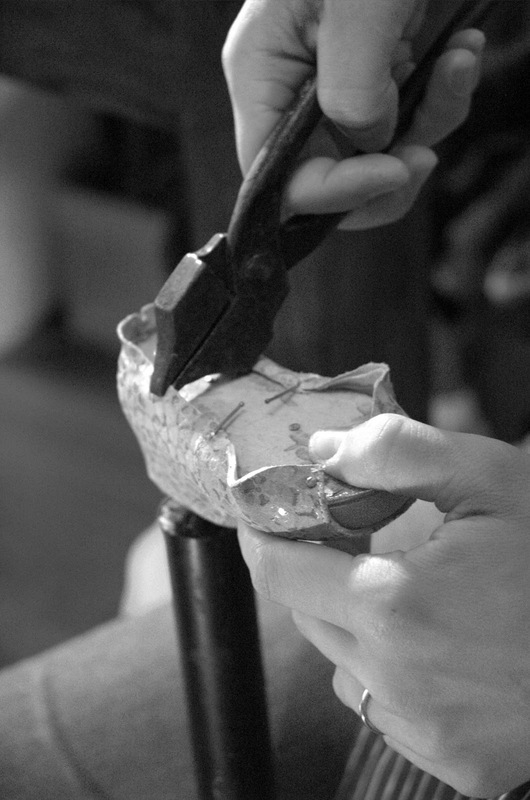 Vivienne later explained to me how she uses recycled materials in her handmade baby shoes. She is fortunate in being allowed to take away the so-called spaghetti pieces left over after the soles for women's shoes have been cut out of leather sole boards by Gina Shoes. Full marks to them. Vivienne then spends hours grouping the pieces by colour because leather being a natural product, no two pieces are ever exactly the same. That done, she works her magic cutting, hand sanding, polishing and buffing. The recycling of materials does not end there. And this is what I find so utterly charming about Vevian. Yes, owner Vivienne could buy in the cardboard needed to create the cushions inside the beautiful handmade shoeboxes. But instead she corrals her nearest and dearest to collect cereal boxes, packaging etc which she then cuts on a press machine to the correct size. The shoeboxes are gorgeous in their own right and are the perfect presentation packaging. 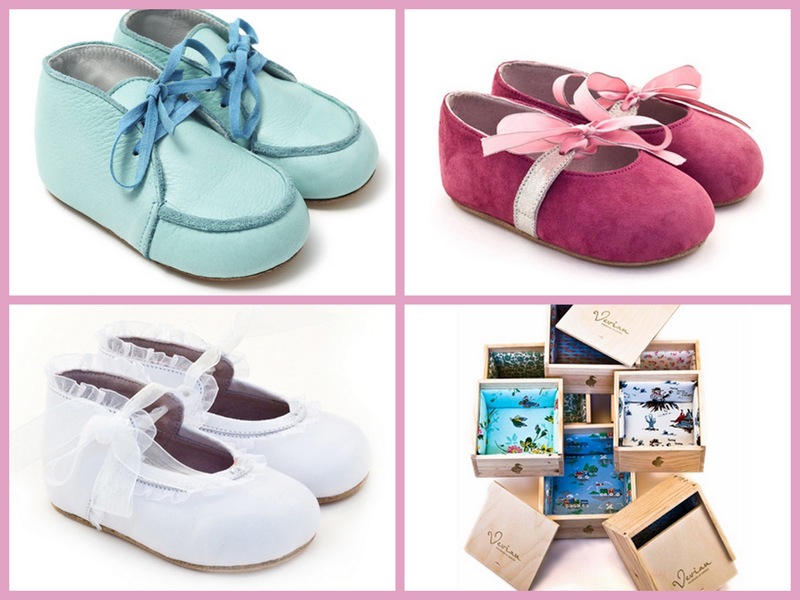 It is no surprise that these heavenly shoes have featured in Vogue and at the relaunch of the children's shoe department at John Lewis' Oxford Street flagship store. Vivienne is a mother of two small children; she launched the brand in 2008 and runs it with the support of her husband and extended family. The shoes are not cheap costing between £89-£95 pounds a pair, but, honestly, what price heaven for baby feet? And especially when recycled materials have been so inventively used in the process. Wonderful to see artisanal skills being used in a modern business.